Be the leader who brings fresh perspectives and real improvements to education. If you are passionate about equity and educational opportunities for all learners and are ready to make a broader impact on your community, our Administration & Supervision program can help you develop into a top-tier education leader. It takes commitment, high energy and enthusiasm to become an effective leader in education. Under the direction of Curry’s nationally acclaimed faculty, you will use these traits to determine effective solutions to the current challenges facing education, and educational leaders. As a student in the Administration & Supervision program, you will help shape the future of educational institutions in the United States. American schools serve diverse populations, and at Curry, we believe it is necessary to weave issues of diversity and equity throughout our coursework so that you can create optimal learning environments for all children. Our goal is to pursue creative solutions to educational challenges through evidence-based research, teaching and service to the field of education. Graduates of our highly ranked Administration & Supervision program find meaningful, impactful work in and out of the classroom. Our graduates have gone on to become superintendents, principals, assistant principals, central office supervisors and other leadership positions. 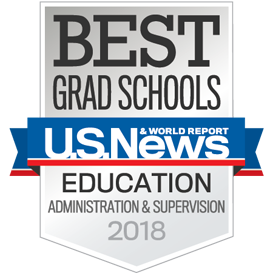 Graduates of our doctoral programs pursue positions in state and federal education agencies, and other organizations serving the professional needs of educators. Others pursue academic or research positions in universities, think tanks, and non-profit organizations. By earning an M.Ed. in Administration & Supervision, you will learn how to guide the teaching of excellent instructors, manage the complex needs of students and parents, and help orchestrate school reform. This innovative program provides unique core classes and an elective class tailored to your interests. It concludes with a meaningful administrative internship that is individually designed for you to promote your growth and development. This program is offered part-time for working professionals in Charlottesville, Falls Church and Richmond. The highly competitive, top-ranked Ed.D. in Administration & Supervision program has advanced the careers of some of Virginia’s and the nation’s most successful education leaders. It prepares individuals like you who recognize that America’s future depends on imagination, creativity, disciplined inquiry and teamwork. It is unique in its approach - a deeply engaging cohort of school leaders in a community of practice similar to the environment they will then create for professionals in their own workplaces. This part-time program in Falls Church holds classes primarily one Friday and Saturday per month. The next cohort starts in summer 2019, with recruitment beginning in fall 2018 and applications due January 15, 2019. If you prefer a small, personalized, top-tier program in education leadership, then it’s time to pursue a Ph.D. in Education — Administration & Supervision. This full-time, research-based program is offered in Charlottesville and investigates: leadership of low-performing schools; policy concerning school turnarounds; K-12 leadership for educational technology; and preparation of educational leaders. The Curry School also hosts the University Council for Educational Administration (UCEA), an international organization representing research universities offering doctoral degrees in educational leadership. Because of UCEA’s affiliation with Administration & Supervision, you will have a variety of opportunities to work on the front lines of innovation in the preparation of educational leaders. "I'm honored to represent the many deserving colleagues that we have in Virginia and am so humbled to have been chosen by superintendents that I admire and those that inspire me. I truly want to thank the Curry School for the amazing education I received to prepare me to become a superintendent." For students who graduated between Fall 2016 and Summer 2017, the average score on the licensure exam (the School Leaders Licensure Assessment, or SLLA), was 182. In Virginia, a passing score on the SLLA is defined by regulation as 165, and 100% of our graduates passed the licensure exam. The program content emphasized leadership for school and organizational improvement. The program provided a coherent learning experience. The program was challenging and intellectually stimulating. I was asked to reflect on practice and analyze how to improve it. The program integrated theory and practice. The program gave me a strong orientation to educational leadership as a career.